A greeting is a marvelous blast of social energy, right? Well, it ought to be. Reality is a lot more complex. How are you? This simple question creates instant social dilemmas. Dan Oropesa, formerly the Relationship Manager at my firm, Influens, also used to own Mack Planet, a popular networking business in Ft. Lauderdale. Dan’s pet greeting peeve? Yes – tired may be true, but why the heck did you come to a networking event? Saying I’m fine when I’m not fine may feel inauthentic. Perpetual “I’m finers” are chronically inauthentic. There’s a fellow at my gym who habitually answers How are you? with Never been better! I have stopped asking. Claiming my tiredness, however, could indeed be a social drag. Let’s take a look at the split-second decisions we juggle in the simple How are you? moment. If you are familiar with Ken Blanchard’s model of Situational Leadership, you know the basic premise – different situations require different types of leadership. The same is true for a greeting, isn’t it? 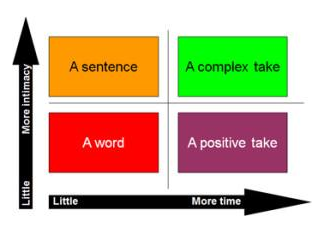 In the Contextual Greeting graph above, I take Blanchard’s 4 quadrants and relate them to our How are you? exchange. Note the two qualitative variables in any social greeting: The amount of time available for a moment, and our level of intimacy with the person we’re greeting. Little time/little intimacy:  One word will do. If you feel tired, I suggest avoiding tired. How about busy? You may be tired because you’ve been so busy. So – your answer is still authentic and, at the same time, socially helpful. More time/little intimacy: Offer a little more information. Wow, it’s been an amazingly busy day. You’re offering the positive take. Still authentic. If you’re talking to someone who is genuinely interested, you know s/he’ll follow up. That’s when you volunteer the less pretty details. Little time/more intimacy:  We’re talking to a trusted friend or cherished colleague now. Wow, it’s been a truly exhausting day. Still short and sweet, but we “own” our tiredness. The other person’s response will determine the depth of our further telling. More time/more intimacy:  Here’s when we can fully “show up” and tell the story. Wow, it’s been one heck of a day. And then we offer an example or two. Hint: Even in a close collegial relationship, don’t unload everything right away. Choose to not overburden a simple social moment. Allow for further inquiry by your colleague. If the moment warrants more detail, your colleague will let you know. A greeting is a powerful exchange of energy with another person. The words we choose define the entire quality of the conversation that ensues. Consider our contextual-greeting-variables as you greet colleagues and friends. Choose well. And energize every single conversation from the onset.